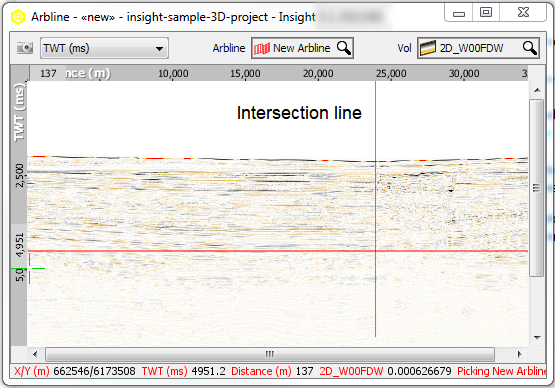 Arblines can also be picked across multiple 2D lines in Map View to analyse the volume information, and follow a known geological structure. Any points picked near a survey line or an intersection of two survey lines will automatically snap to the line or intersection. Refer to Creating an Arbline to create a new arbline. Click on the Pick arbline pencil icon to start tracing the arbline in the Map View. Alternatively, you can right click in the map and select Pick "Arbline" to begin tracing the arbline. To pick on a 2D line, simply click on or near the line and the point will automatically snap to the line. If the next point you pick is on the same line, the arbline will follow the survey line. The listed points in the arbline Details Panel will say Points (Locked to a survey) when an arbline is automatically snapped to a survey. Note: Red points are locked to 2D lines. Points not placed on 2D surveys are displayed in grey. Clicking on intersections of 2D lines will automatically snap the picked point to the intersection. This makes it easier for users to extend the arbline to a different line. To unsnap points, right-click to stop the tracing first. On the arbline, right-click again and the select Unsnap "Arbline" from surveys. Data can be viewed along the arbline using the Arbline View. The following image shows an example of the arbline (pictured above) in the Arbline View. The vertical line indicates the location of the point where the arbline bends. In this case, it is the location of the intersection. Tip: To enable or disable arbline markers, press the keyboard hotkey Ctrl+Shift+U.